Several dozen radical Jews gathered Monday at the Jerusalem site known as the Cenacle to protest against Christian pilgrims praying there for Pentecost, a police spokeswoman said. "Around 30 Jewish faithful gathered to pray in the presence of (rightwing Likud) MP Moshe Feiglin," Luba Samri told AFP. The Cenacle, or Upper Room, on Mount Zion is in a two-story building considered holy to both Christians and Jews, who regard it as the place where the biblical figure David was buried. An AFP photographer said Christian pilgrims and tourists were kept by police in one part of the church as Jews protested, danced, and prayed. Pope Francis ended his recent Middle East trip by celebrating mass at the Cenacle, amid a decades-long debate over prayer rites at the site where Christians believe Jesus had his Last Supper. For Jews, it is the ground floor which is sacred, revered since the 12th century as the burial place of David, who ruled from Jerusalem, although the site has never been excavated and the contents of its sarcophagus are unknown. The Cenacle is also where Christians believe that the Holy Spirit descended at Pentecost, 50 days after Easter. "The Christians prayed at the tomb of king David, and for us this is blasphemy," one of the Jewish protesters, Shaga Brand, told AFP about Christian prayers there on Sunday, calling it a "provocation". The protesters also hung placards in the nave accusing the government of lying by saying the Cenacle's status quo would remain unchanged and under Israeli authority. Under Israeli law, Christians are only allowed to pray there twice a year, prompting efforts by the Vatican to negotiate greater access rights to what is one of the most sacred sites in Christendom. Those attempts have sparked a major backlash by nationalist Jewish groups, many of whom wrongly believe Israel is poised to sign over sovereign rights to the site. 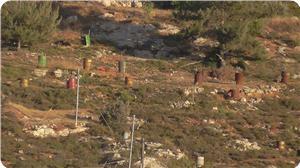 Hordes of Jewish settlers confiscated Palestinian land lots in Qaryut village, south of Nablus, on Friday evening. Bashar al-Qaryuti, an anti-settlement activist in the village, said that settlers from the nearby settlement of Shilo laid their hands on the land lots in Ras Muweis area, which is near to their settlement. He said that the settlers put barrels around the trees and installed a water network on the land. A group of Israeli settlers headed by extremist Rabbi Yehuda Glick stormed Sunday al-Aqsa Mosque courtyards from Mughrabi Gate under heavy police protection. The radical Rabbi Glick stormed al-Aqsa Mosque on Sunday joined by groups of Jewish settlers to whom he lectured about the alleged Temple. Local sources said that Israeli break-ins into al-Aqsa Mosque have been recently escalated regularly, usually touring around the yards starting from the Mughrabi Gate. The settlers' break-in coincided with the start of the summer camp for students in al-Aqsa Mosque that witnessed huge participation on the part of Jerusalemite youths and children. Meanwhile, Israeli tight restrictions are still imposed on Jerusalemite worshipers and students' access to al-Aqsa Mosque, as the Israeli forces continued to confiscate their identity cards at the its entrances. This morning, 160 settlers under the protection of Israeli police marched through the courtyards of al-Aqsa Mosque from the Mughrabi Gate. Director of Media at Aqsa Foundation for Waqf and Heritage, Mahmoud Abu al-Atta, told ALRay that 160 settlers, 30 of them Israeli college students, stormed al-Aqsa Mosque, organized tours in its courtyards, and tried to perform Talmudic prayers before Muslim worshipers prevented them from doing so. Israeli authorities seized more than 40 identity cards from worshipers, he added. Abu al-Atta also warned of the possible outbreak of clashes at any given moment, as calls to storm Al-Aqsa Mosque by Jewish religious institutions frequent and ongoing. In recent months, Al Ray further reports that groups of Jewish settlers, often accompanied by Israeli security forces, have repeatedly forced their way into the complex, angering Palestinian Muslims and leading to violent confrontations. See related link: "Increase in Israeli Violations Against Holy Sites in oPt"
Israeli soldiers invaded different parts of the occupied West Bank, broke into and searched several homes, and kidnapped at least five Palestinians. Hasan Breijeyya, coordinator of the Popular Committee against the Wall and settlements in Bethlehem, stated that the army kidnapped Mahmoud Hussein Zawahra, 43, after breaking into his home and searching it. Zawahra is in charge of the Israeli Annexation Wall file at the Palestinian Authority, in the West Bank district of Bethlehem, the WAFA News Agency has reported. 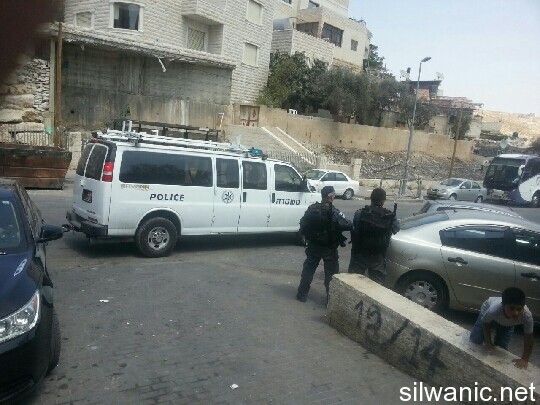 Soldiers also invaded Anza village, south of the northern West Bank city of Jenin, and handed another resident a military warrant ordering him to the Salem military base for interrogation. Local sources said the army kidnapped Ali Bassam ‘Eetany, 18, after dozens of soldiers invaded his father’s home, and ransacked it. Soldiers also invaded and searched several homes, and handed resident Fadi Mahmoud Sadaqa, 19, a warrant ordering him to head to the Salem base for interrogation. 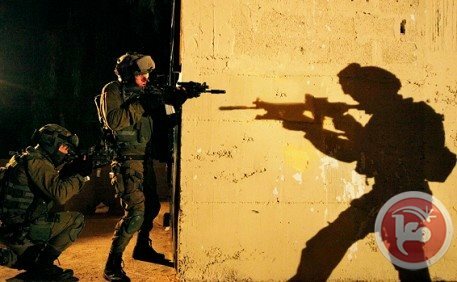 In addition, soldiers invaded Aseera ash-Shemaliyya village, north of the northern West Bank city of Nablus, and kidnapped one Palestinian identified as Hussein Mohammad Abu Daoud, 25. In related news, soldiers invaded various communities in the southern West Bank district of Hebron, and kidnapped two Palestinians. WAFA said the army kidnapped Ali Ismael Zama’ra, 23, from Halhoul town north of Hebron, and Mohammad Yacoub Najjar, from ar-Reehiyya village, south of the city, and took them to the Etzion military base for interrogation. In addition, soldiers installed a roadblock at the Zeef Junction, east of Hebron, stopped and searched dozens of Palestinian cars, and interrogated the passengers while examining their ID cards. Also, soldiers, and settlers of the Karmiel illegal settlement, attacked Palestinian villagers of Um al-Kheir village, and threatened to displace them if they continue to “use clay ovens, as they produce smoke”, according to the Israeli allegations. 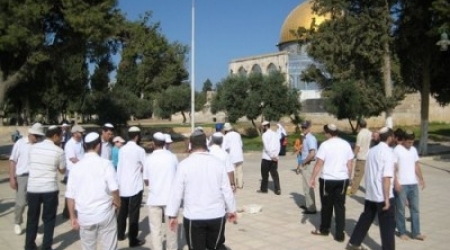 Over one hundred right-wing Israelis entered the Al-Aqsa Mosque compound on Thursday as part of celebrations for the Jewish holiday of Shavuot. Some 170 right-wing religious Jews entered the compound, including Michael Ben-Ari, a former MK, and far-right Jewish activist Yehuda Glick. Glick is the chairman of the controversial Temple Mount Heritage Fund, which seeks to establish a Jewish Temple in the Asqa compound. 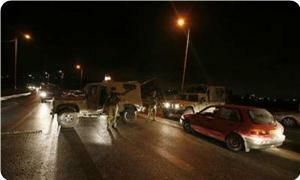 Palestinian worshipers chanted 'Allahu Akbar' at the group, who were escorted around the area under armed guard. Sheikh Azzam al-Khatib, from the PA's endowment ministry, said Al-Aqsa is going through a "dangerous phase" and criticized Israeli police for allowing the visits to take place. Because of the sensitive nature of the Al-Aqsa compound, Israel maintains a compromise with the Islamic trust that controls it to not allow non-Muslim prayers in the area. 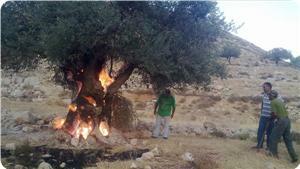 Jewish settlers set alight perennial olive trees in the Old City of al-Khalil on Wednesday, local sources reported. 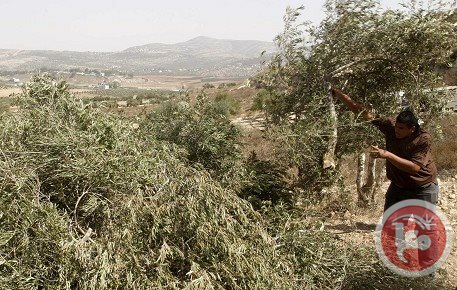 They said that the settlers torched the olive trees belonging to the Eqnaibi family in Tal al-Rumaida, in the southern suburb of the city, adding that they are thousands of years old. Settlers hope that their recurrent attacks would force the Palestinian natives to abandon their land and homes and leave them for those settlers. The Israeli occupation forces (IOF) last night intensified their presence in different areas of Nablus city to provide protection for Jewish settlers who came in droves to visit the mausoleum of Joseph's tomb. Local sources told the Palestinian information center (PIC) that many Israeli troops were deployed at Za'tara checkpoint, which is located between Nablus and Ramallah. They added that scores of Jewish settlers entered the city in buses at a late night hour under military protection to perform rituals at the mausoleum. 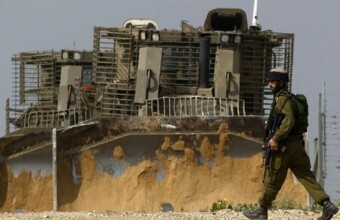 An intensive Israeli military presence was also reported in the vicinity of the Hawara town. Citizens from Hawara told the PIC that the IOF warned the residents of severe punitive measures if any passing buses or vehicles carrying Jewish settlers were attacked with stones. In another incident, the IOF declared on Wednesday evening that it had closed permanently the southern entrance to Aqraba town, south of Nablus. He added that the Israel continues to build in this area, south of Bethlehem, most likely as an effort to extend the illgal settlement of Efrat from its eastern and southern sections, in order to divide Bethlehem. Israeli settlers set fire to dozens of olive trees in the Palestinian villages of Farata and Immatin west of Nablus on Wednesday, a local official said. Ghassan Daghlas, a Palestinian Authority official who monitors settlement activities in the West Bank, told Ma'an that "a number of settlers from the Havat Gilad settlement burned dozens of trees and the fire spread in the area" in a targeted attack on local villagers. Daghlas also told Ma'an that "Palestinian civil defense was trying to reach the area to put out the fire." Havat Gilad ("Gilad's Farm") is a small Jewish outpost located on a main road just east of a large settlement block, while the two villages are caught between the two. Havat Gilad settlers frequently attack local villages, torching cars, hurling rocks, and destroying olive trees, the economic mainstay of many area villages. 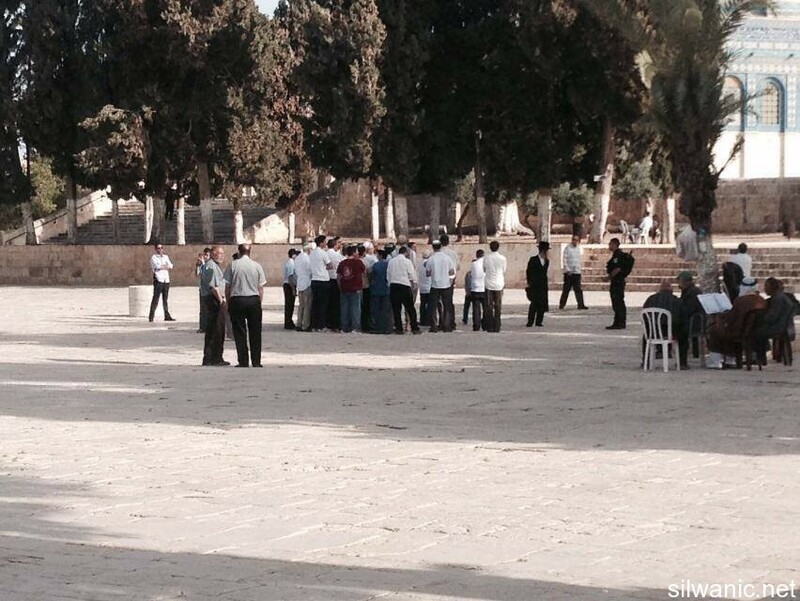 Witnesses from inside Al-Aqsa said that dozens of settlers broke into Al-Aqsa through Dung Gate in the form of groups. Among them was the member of Knesset, Michael Ben Ari, who broke into Al-Aqsa along with another group of extremists and chanted “the Temple Mount is now in our hands”. Also, Rabbi Yehuda Galik was among the settlers breaking into Al-Aqsa and led three groups and they performed their religious rituals while inside Al-Aqsa and under heavy protection from the police. One settler verbally assaulted Sheikh Abdelatheem Salhab, director of Al-Awqaf council, and the guards confronted the setters and the police immediately took him outside Al-Aqsa. Witnesses also explained that the Israeli police closed all of Al-Aqsa Gates except for (Hutta, Al-Majles and Al-Silsileh) and established iron barriers at the gates. They also prevented men under the age of 50 from entering Al-Aqsa as well as preventing women of all ages and Al-Aqsa students (Masateb). 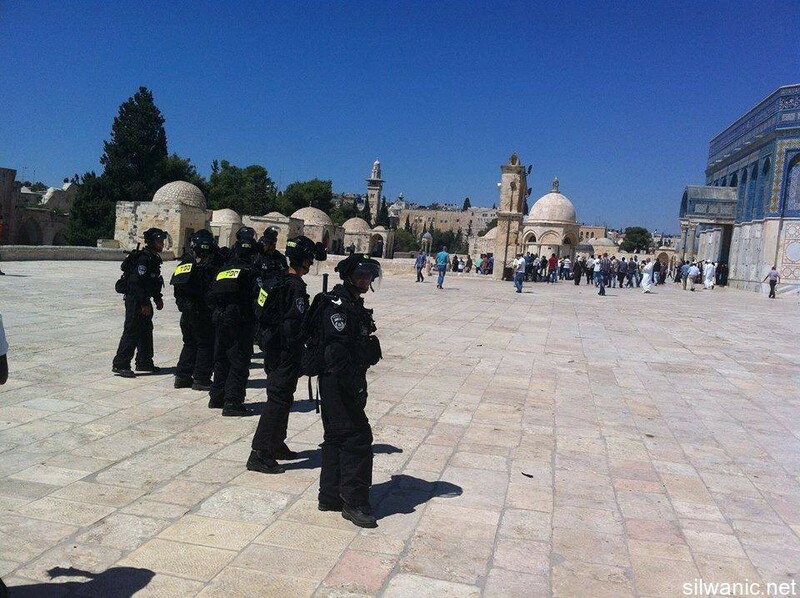 Scattered clashes broke out near Al-Aqsa Gates between the worshippers and the forces stationed at the Gates. The forces arrested one man near Hutta Gate while attempting to enter Al-Aqsa. 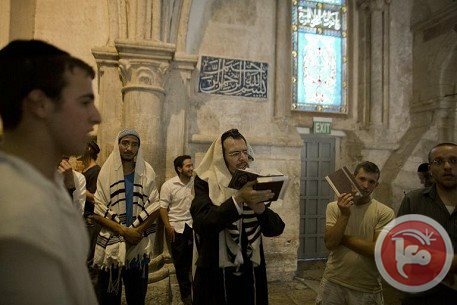 Israeli forces imposed restrictions on Palestinian worshipers in Jerusalem on Tuesday for the Jewish holiday of Shavuot. Witnesses told Ma'an that Israeli forces closed the main entrances to Al-Aqsa Mosque and only allowed men over 50 to enter. Students were also denied entry. Employees of the Palestinian Ministry of Endowment were eventually allowed in after being made to wait. Restrictions began on Monday when Palestinian worshipers were denied entry for noon prayers. Since the, hundreds of Palestinians have been denied access. 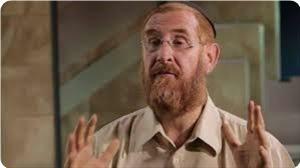 Ministry of Endowment officials said that over 150 right-wing Jews have visited the compound, including far-right MK Yehuda Glick. Michael Ben-Ari, a former MK, said Tuesday that he planned to visit the mosque compound. Shavuot commemorates the anniversary of when Jews believe that God gave the Torah to the Jewish people on Mount Sinai. Israeli authorities regularly impose restrictions on the entrance of Palestinian Muslim worshipers to the Al-Aqsa compound, which is located in the heart of occupied East Jerusalem. Al-Aqsa Foundation for Endowment and Heritage said in a statement on Tuesday that Israeli occupation forces imposed tight restrictions on Palestinian worshipers' access to al-Aqsa Mosque. 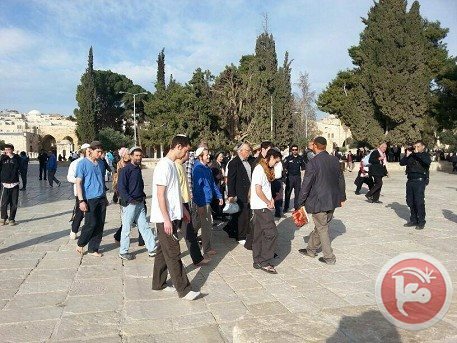 The Foundation confirmed that dozens of settlers broke into al-Aqsa Mosque, since the early morning hours, from the Magharbeh Gate. Tight restrictions were imposed on the entry of Palestinians to the mosque, as worshipers under the age of 50 were prevented from having access to its plazas in addition to some students. A state of tension prevailed following the imposed Israeli restrictions, as students of Islamic schools started shouting 'Takbeer' and slogans in support of al-Aqsa Mosque. Israeli intensive presence and restrictions at the holy mosque came in coincidence with Shavuot Holiday (the day when God gave the Jewish people the Torah following Moses' descent from Mount Sinai). The alleged Temple organizations and extremist Jewish institutions have called for breaking into al-Aqsa Mosque starting from Tuesday. Mk Michael Ben- Ari said that around 100 of his supporters are going to storm al-Aqsa Mosque today to perform Talmudic rituals. Jewish websites and Facebook pages have called for storming al-Aqsa Mosque on Tuesday, Wednesday, and Thursday to mark Shavuot Holiday. Al-Aqsa Foundation warned of the seriousness of Israeli escalated attacks and break-ins and continued attempts to impose a status quo in al-Aqsa Mosque. 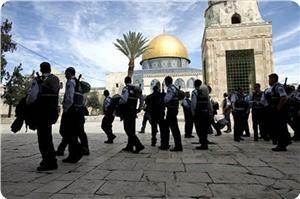 The foundation called for intensifying Palestinian presence in al-Aqsa Mosque in order to defend the holy site. The Israeli police prevented on Monday hundreds of worshippers from entering Al-Aqsa Mosque to perform the Noon, Afternoon, Evening and Night Prayers on the eve of the “descent of the Torah”. Wadi Hilweh Information Center was informed that the Israeli siege on Al-Aqsa started in the early morning by preventing women from entering Al-Aqsa under the pretext of not having their IDs with them; note that the IDs are detained in Al-Qishleh police center since Sunday. Israeli forces were deployed at Al-Aqsa Gates and they surrounded the female Marabouts who were not allowed to enter Al-Aqsa. At 11:00 a.m. the Israeli forces started imposing restrictions on the entrance of young men and detained the IDs of some of them and prevented others from going in. At 12:00 p.m. the police suddenly closed Al-Aqsa Gates except for Al-Silsileh, Hutta and Al-Majles Gates and prevented men under the age of 50 from entering in addition to preventing all women. The Israeli procedures came on the eve of the “biblical pilgrimage” as several extremist Jewish groups called to break into Al-Aqsa Mosque in groups in order to fulfill the commandment of the Torah, which impose on them a pilgrimage three times a year to the alleged Temple Mount, according to the texts of the Torah. The extremist Ben Ari announced his intent to break into Al-Aqsa Mosque on Tuesday along with 100 of his extremist followers. 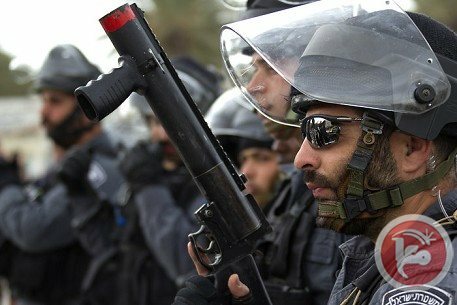 He said that he will stand by the Gates of Al-Aqsa and challenge the police and Arabs and that the police must allow him to celebrate the “Shavuot” holiday. He ended his announcement by saying “the Temple Mount is now in our hands”..
A number of Israeli settlers of the Abigail illegal settlement outpost, east of Yatta, south of the southern West Bank city of Hebron, invaded Palestinian lands near the outpost, and started preparation work meant for expanding it. 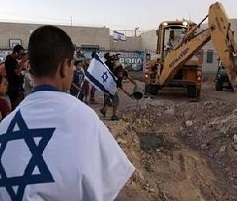 Rateb Jabour, coordinator of the Popular and National Committee against Settlements and the Wall in Hebron, stated that the settlers brought, on Sunday at night, several bulldozers and construction materials, and started preparation work on Palestinian lands, to expand their illegitimate outpost, built on Palestinian property. Jabour said the settlers aim at replacing the mobile homes with concrete structures in an attempt to expand their outpost, and attempt to legalize it. He added that recent violation is part of ongoing illegal policies aiming at “legalizing” outposts, and illegally occupying more Palestinian lands to expand the settlements in the area, and create geographical contiguity between them by isolating Palestinian communities and deny the Palestinians access to their own lands. Settlements in the occupied territories are illegal under International Law, all basic resolutions, and international agreements, including the Fourth Geneva Convention to which Israel is a signatory.